Allows you preview, decode and convert raw digital camera images in Opus. The plugin allows you to preview, decode and convert many raw digital camera formats within Opus. The plugin supports the Adobe DNG format as well as the proprietary formats used by hundreds of different camera models. 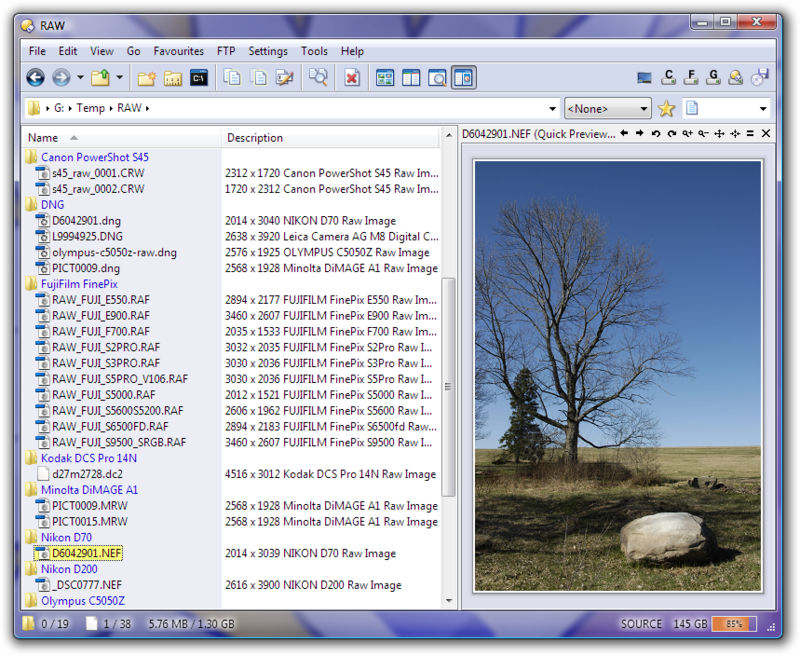 Raw image details and preview panel in Directory Opus. 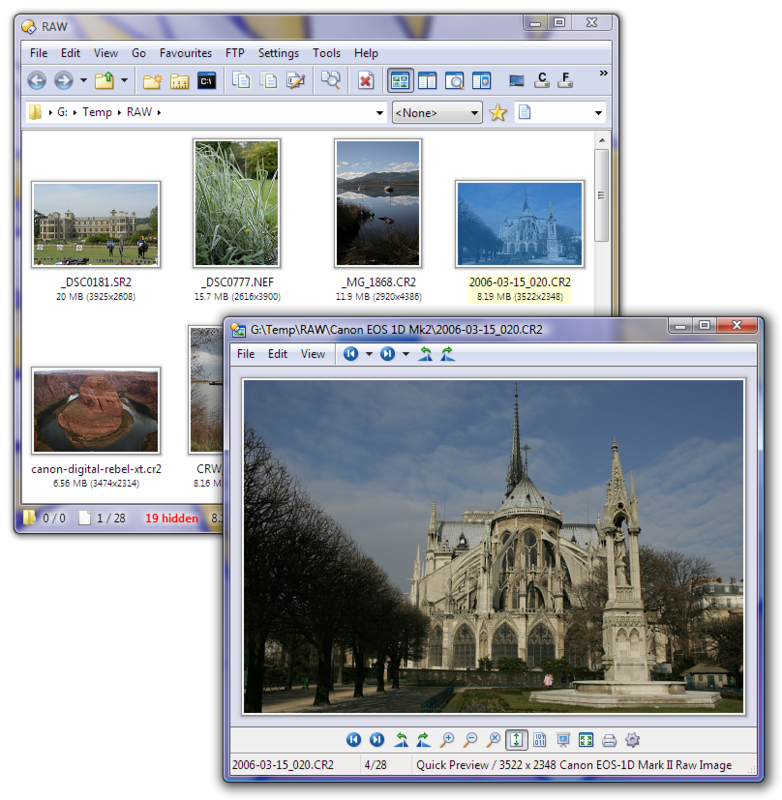 Raw image thumbnails and viewer window in Directory Opus. 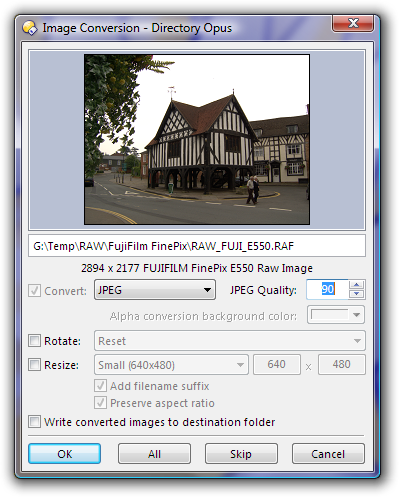 Raw image conversion in Directory Opus. One-click batch conversion is also possible. Raw plugin configuration in Directory Opus. The Raw Digital Camera plugin is packaged as part of Directory Opus itself but you may sometimes find a newer version here. You should already have the latest version of the Raw Digital Camera plugin if you have the latest Opus 10 release installed. You should already have the latest version of the plugin which still supports Opus 9 if you have the latest release of Opus 9. You should use the older JP2Raw Plugin instead as it works with Opus 8. The Raw Digital Camera plugin requires features of Opus 9 and will not work with Opus 8. There is no raw plugin which works with Opus 6. Will be included with Directory Opus 12.0.7. Included with Directory Opus 11.14. Included with Directory Opus 11.13. Included with Directory Opus 11.11. Updated DCRaw code (still called v9.23). Fix for issue with DNG images from Epson Perfection3490 scanners. 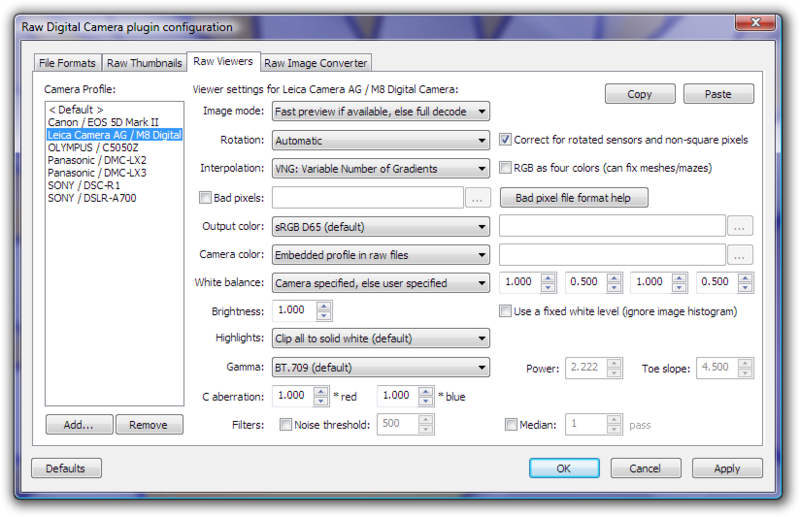 Fix for transposed DNG images from Fujifilm S7000 cameras. 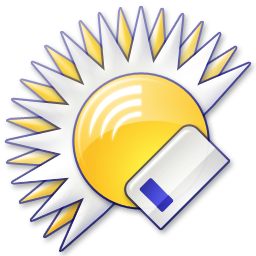 Included with Directory Opus 10.0.5.3. Updated to code from DCRaw 9.15, adding support for newer DNG files and some new cameras. Included with Directory Opus 10.0.3.3. Updated to code from DCRaw 9.12, adding support for some more cameras (e.g. Canon S100). Included with Directory Opus 10.0.1.0. Fixed crash if image loading cancelled just after it was started (e.g. if scrolling through raw images with the cursor keys while the viewer is open). Included with Directory Opus 10.0.0.2. Updated to DCRaw 9.08 code, adding & improving support for various cameras. Included with Directory Opus 9.1.2.1. Added several new file extensions to the defaults. Fix for multi-threaded thumbnails not always working. Fix for having to restart Opus for changes to the list of raw extensions to take effect. This new plugin is basically a re-write of the raw support in the old JP2Raw plugin (which is why the version number has started at 2). Supports many more camera formats compared to the old JP2Raw plugin. Separate configuration for the image converter, allowing you to keep thumbnails and previews quick but do slow, high-quality batch conversions when you want to turn your raw images into a standard format. The source code includes a custom wrapper around the original dcraw code to turn it into thread-safe, static-linked, resource-tracking C++ with support for UTF-16 filepaths.